Dadi Temple is located at an altitude of 360 meters above sea level, and is in the middle of RPH Kalidawir forest. 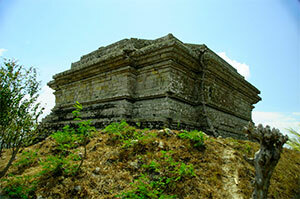 The temple is located in the region of Mojo Hamlet, Wajak Kidul Village. It lies on a hilltop and we had to climb down the path in the forest and land crops. This temple is typical single temple that has no ornaments and statues. The temple stands upright on top of a hill in the neighborhood of Walikukun Mountains. The site plan temple is square with a length of 14m and 14m width and 6.5 m height. The building of this temple is made of andesite and it consists of shelf and the foot of the temple. The top shelf is on octagon shape, on the surface seems the former round shaped wall which is likely to be functioned as well. The diameter of the wells is 3.35m with a depth of 3m.